Title: "Old School New School"
Synopsis: Near my house there is an old elementary school, Farrer Elementary. It's slowly falling apart, it's several decades old, old enough to have some really nice stone masonry on it. Anyway, this year, they are building a new school--right in the playground of the old school. So the kids are all watching the construction day by day. This book is about that scenario. We'll see the construction progress, and compare the school kids' day to the construction workers.' At the end, we'll get to see the old school demolished and the new building opened. Hey, they don't all have to be funny do they? It could be fun to play with that idea, doing things "old school" and "new school." What if both schools stayed open as separate schools? Great ideas for this entire series. I'm enjoying the posts. Well, what do you know. I attended Farrer Jr. High School in the 60's. I had no idea it was now an elementary school and slated to be demolished. My old elementary school Maeser is also no longer in use. What will they do next, close Provo High? Thanks for the unexpected update. I like the book idea. Your imagination knows no bounds! 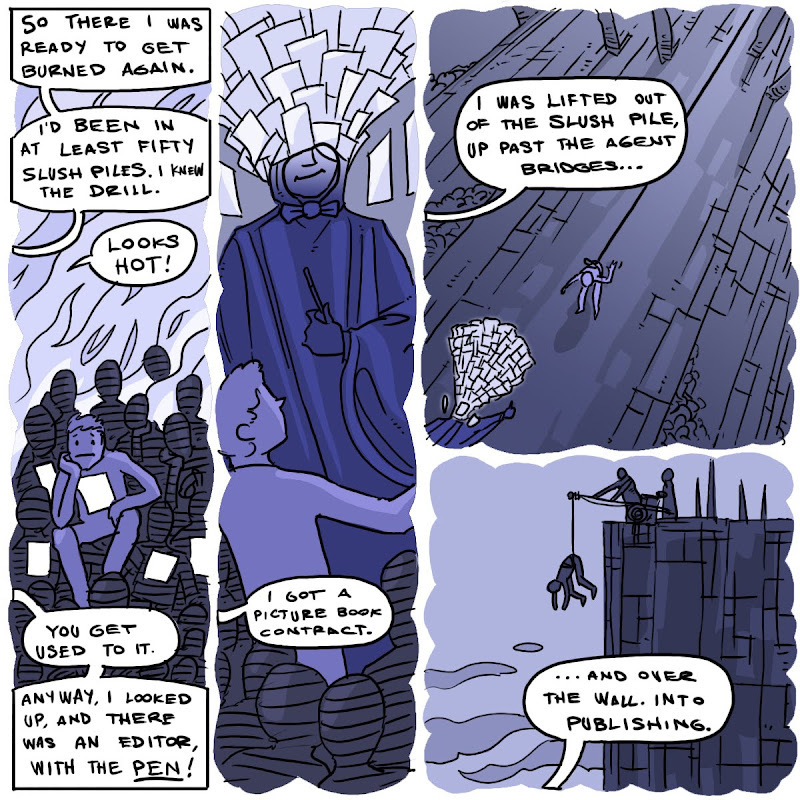 I love this comic series. It's my favorite by far. Also, I'm so glad your 12 Robo-days of Christmas were picked up! Congratulations! I hoped it would see print soon :). My old school Valley Elementary is being torn down this week as well. Very sad. I'm glad you can make it seem up. I need to go look at the plaque to see how old the Farrer school is--there's a little monument on the corner of the property talking about how old the school is. I guess they'll have to tear it down too. Anyway, I'll check it out. My original grade school got torn down too, about five years ago. Timpanogos Elementary (I was there from K-2nd grade.) It was a great old school that looked like something from Pink Floyd's "We Don't Need No Education." Tall stairways, giant leaded windows, pretty cool place. I wanted to go in and shoot some schoolroom reference, but I never got in before they tore it down. Farrer has a great auditorium/cafeteria space that my daughter does dance recitals in. Really low ceiling with flags hanging down--pretty odd room. 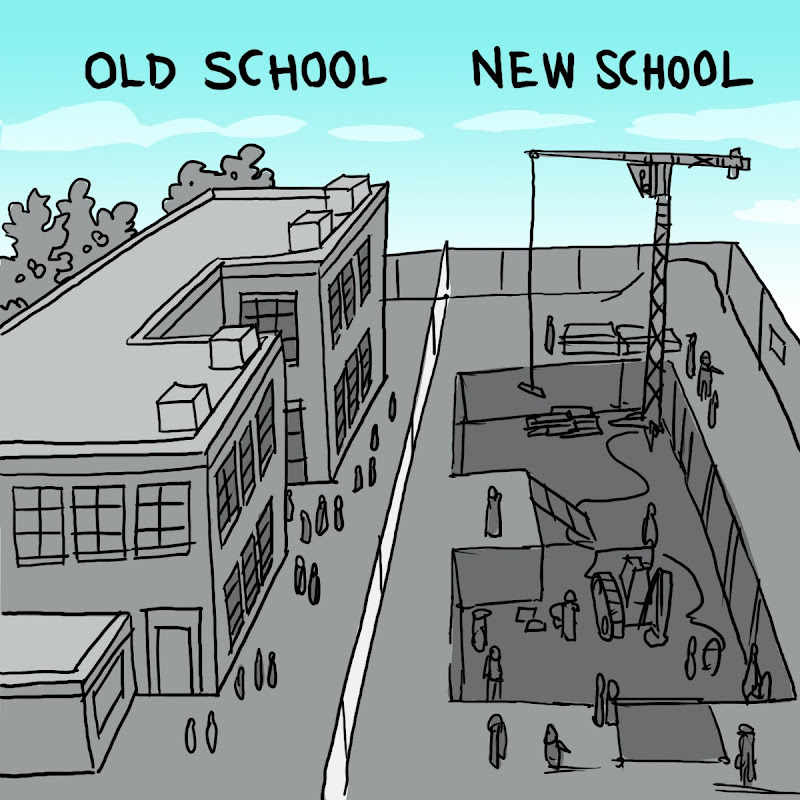 Maybe they could use the same building materials and the old school slowly gets taken apart as the new one is built. Like, oh, no...now we have no roof! My son loves all construction books. They were nice for when our house was getting built and he wasn't allowed inside, I could sort of show him what was going on. I like the idea of this book too. It could be taken in a lot of different directions - from very thoughtful to sad to parallel viewpoints. So many possibilities. They did this exact thing when I was in elementary school--built the new school on the playground and then tore the old school down. I can't remember where we played while the new one was being built.